In the Constitution Ineffabilis Deus of 8 December, 1854, Pius IX pronounced and defined that the Blessed Virgin Mary "in the first instance of her conception, by a singular privilege and grace granted by God, in view of the merits of Jesus Christ , the Saviour of the human race , was preserved exempt from all stain of original sin." "...in the first instance of her conception..."
The term conception does not mean the active or generative conception by her parents. Her body was formed in the womb of the mother, and the father had the usual share in its formation. The question does not concern the immaculateness of the generative activity of her parents. Neither does it concern the passive conception absolutely and simply ( conceptio seminis carnis, inchoata ), which, according to the order of nature, precedes the infusion of the rational soul. The person is truly conceived when the soul is created and infused into the body. Mary was preserved exempt from all stain of original sin at the first moment of her animation, and sanctifying grace was given to her before sin could have taken effect in her soul. The formal active essence of original sin was not removed from her soul, as it is removed from others by baptism ; it was excluded , it never was in her soul. Simultaneously with the exclusion of sin. The state of original sanctity, innocence, and justice, as opposed to original sin, was conferred upon her, by which gift every stain and fault, all depraved emotions, passions, and debilities, essentially pertaining to original sin, were excluded. But she was not made exempt from the temporal penalties of Adam -- from sorrow, bodily infirmities, and death. "...by a singular privilege and grace granted by God, in view of the merits of Jesus Christ, the Saviour of the human race." The immunity from original sin was given to Mary by a singular exemption from a universal law through the same merits of Christ, by which other men are cleansed from sin by baptism. Mary needed the redeeming Saviour to obtain this exemption, and to be delivered from the universal necessity and debt ( debitum ) of being subject to original sin. The person of Mary, in consequence of her origin from Adam, should have been subject to sin, but, being the new Eve who was to be the mother of the new Adam, she was, by the eternal counsel of God and by the merits of Christ, withdrawn from the general law of original sin. Her redemption was the very masterpiece of Christ's redeeming wisdom. He is a greater redeemer who pays the debt that it may not be incurred than he who pays after it has fallen on the debtor. No direct or categorical and stringent proof of the dogma can be brought forward from Scripture. But the first scriptural passage which contains the promise of the redemption, mentions also the Mother of the Redeemer. 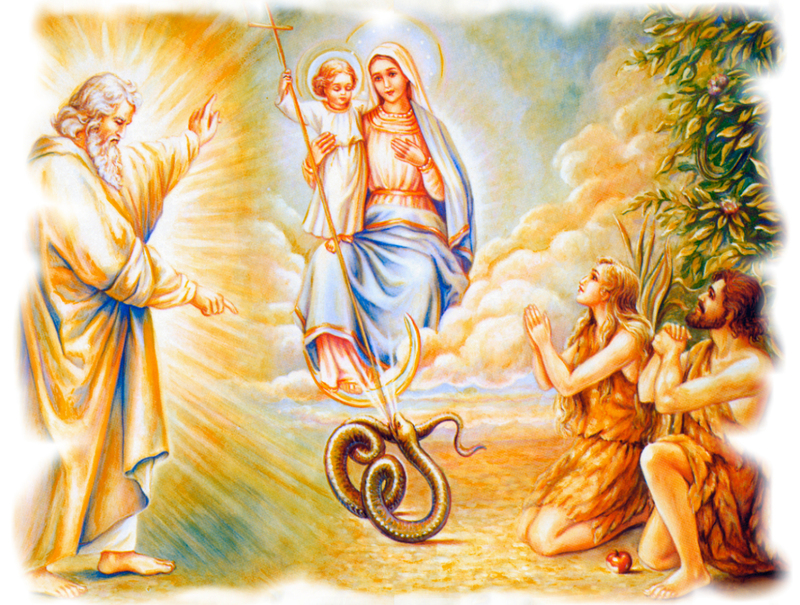 The sentence against the first parents was accompanied by the Earliest Gospel ( Proto-evangelium ), which put enmity between the serpent and the woman : "and I will put enmity between thee and the woman and her seed; she (he) shall crush thy head and thou shalt lie in wait for her (his) heel" ( Genesis 3:15 ). The translation "she" of the Vulgate is interpretative; it originated after the fourth century, and cannot be defended critically. The conqueror from the seed of the woman, who should crush the serpent's head, is Christ ; the woman at enmity with the serpent is Mary. God puts enmity between her and Satan in the same manner and measure, as there is enmity between Christ and the seed of the serpent. Mary was ever to be in that exalted state of soul which the serpent had destroyed in man, i.e. in sanctifying grace. Only the continual union of Mary with grace explains sufficiently the enmity between her and Satan. The Proto-evangelium, therefore, in the original text contains a direct promise of the Redeemer, and in conjunction therewith the manifestation of the masterpiece of His Redemption, the perfect preservation of His virginal Mother from original sin. 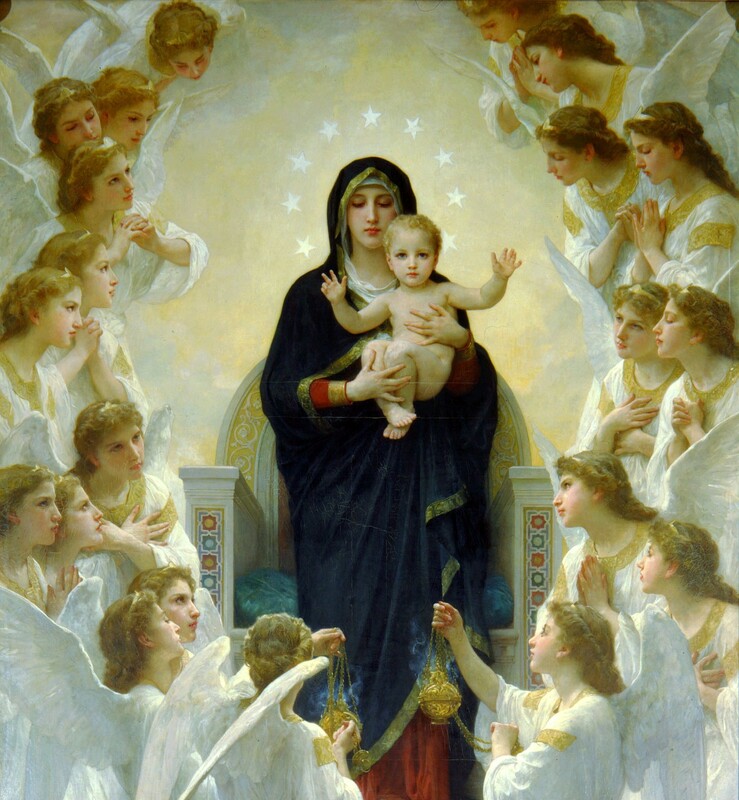 The salutation of the angel Gabriel -- chaire kecharitomene , Hail, full of grace ( Luke 1:28 ) indicates a unique abundance of grace, a supernatural, godlike state of soul, which finds its explanation only in the Immaculate Conception of Mary. But the term kecharitomene (full of grace ) serves only as an illustration, not as a proof of the dogma. From the texts Proverbs 8 and Ecclesiasticus 24 (which exalt the Wisdom of God and which in the liturgy are applied to Mary, the most beautiful work of God's Wisdom), or from the Canticle of Canticles ( 4:7 , "Thou art all fair, O my love, and there is not a spot in thee"), no theological conclusion can be drawn. These passages, applied to the Mother of God , may be readily understood by those who know the privilege of Mary, but do not avail to prove the doctrine dogmatically, and are therefore omitted from the Constitution "Ineffabilis Deus". For the theologian it is a matter of conscience not to take an extreme position by applying to a creature texts which might imply the prerogatives of God. The older feast of the Conception of Mary (Conception of St. Anne), which originated in the monasteries of Palestine at least as early as the seventh century, and the modern feast of the Immaculate Conception are not identical in their object. Originally the Church celebrated only the Feast of the Conception of Mary, as she kept the Feast of St. John's conception, not discussing the sinlessness. This feast in the course of centuries became the Feast of the Immaculate Conception, as dogmatical argumentation brought about precise and correct ideas, and as the thesis of the theological schools regarding the preservation of Mary from all stain of original sin gained strength. Even after the dogma had been universally accepted in the Latin Church , and had gained authoritative support through diocesan decrees and papal decisions, the old term remained, and before 1854 the term "Immaculata Conceptio" is nowhere found in the liturgical books, except in the invitatorium of the Votive Office of the Conception. The Greeks, Syrians, etc. call it the Conception of St. Anne ( Eullepsis tes hagias kai theoprometoros Annas , "the Conception of St. Anne, the ancestress of God"). Passaglia in his "De Immaculato Deiparae Conceptu," basing his opinion upon the "Typicon" of St. Sabas: which was substantially composed in the fifth century, believes that the reference to the feast forms part of the authentic original, and that consequently it was celebrated in the Patriarchate of Jerusalem in the fifth century (III, n. 1604). But the Typicon was interpolated by the Damascene, Sophronius, and others, and, from the ninth to the twelfth centuries, many new feasts and offices were added. To determine the origin of this feast we must take into account the genuine documents we possess, the oldest of which is the canon of the feast, composed by St. Andrew of Crete, who wrote his liturgical hymns in the second half of the seventh century, when a monk at the monastery of St. Sabas near Jerusalem (d. Archbishop of Crete about 720). But the solemnity cannot then have been generally accepted throughout the Orient, for John, first monk and later bishop in the Isle of Euboea, about 750 in a sermon, speaking in favour of the propagation of this feast, says that it was not yet known to all the faithful ( ei kai me para tois pasi gnorizetai ; P. G., XCVI, 1499). But a century later George of Nicomedia, made metropolitan by Photius in 860, could say that the solemnity was not of recent origin (P. G., C, 1335). It is therefore, safe to affirm that the feast of the Conception of St. Anne appears in the Orient not earlier than the end of the seventh or the beginning of the eighth century. As in other cases of the same kind the feast originated in the monastic communities. The monks, who arranged the psalmody and composed the various poetical pieces for the office, also selected the date, 9 December, which was always retained in the Oriental calendars. Gradually the solemnity emerged from the cloister, entered into the cathedrals, was glorified by preachers and poets, and eventually became a fixed feast of the calendar, approved by Church and State. It is registered in the calendar of Basil II (976-1025) and by the Constitution of Emperor Manuel I Comnenus on the days of the year which are half or entire holidays, promulgated in 1166, it is numbered among the days which have full sabbath rest. Up to the time of Basil II, Lower Italy, Sicily, and Sardinia still belonged to the Byzantine Empire ; the city of Naples was not lost to the Greeks until 1127, when Roger II conquered the city. The influence of Constantinople was consequently strong in the Neapolitan Church, and, as early as the ninth century, the Feast of the Conception was doubtlessly kept there, as elsewhere in Lower Italy on 9 December, as indeed appears from the marble calendar found in 1742 in the Church of S. Giorgio Maggiore at Naples. Today the Conception of St. Anne is in the Greek Church one of the minor feasts of the year. The lesson in Matins contains allusions to the apocryphal "Proto-evangelium" of St. James, which dates from the second half of the second century. To the Greek Orthodox of our days, however, the feast means very little; they continue to call it "Conception of St. Anne", indicating unintentionally, perhaps, the active conception which was certainly not immaculate. In the Menaea of 9 December this feast holds only the second place, the first canon being sung in commemoration of the dedication of the Church of the Resurrection at Constantinople. The Russian hagiographer Muraview and several other Orthodox authors even loudly declaimed against the dogma after its promulgation, although their own preachers formerly taught the Immaculate Conception in their writings long before the definition of 1854. In the Western Church the feast appeared (8 December), when in the Orient its development had come to a standstill. The timid beginnings of the new feast in some Anglo-Saxon monasteries in the eleventh century, partly smothered by the Norman conquest, were followed by its reception in some chapters and dioceses by the Anglo-Norman clergy. But the attempts to introduce it officially provoked contradiction and theoretical discussion, bearing upon its legitimacy and its meaning, which were continued for centuries and were not definitively settled before 1854. The "Martyrology of Tallaght" compiled about 790 and the "Feilire" of St. Aengus (800) register the Conception of Mary on 3 May. It is doubtful, however, if an actual feast corresponded to this rubric of the learned monk St. Aengus. This Irish feast certainly stands alone and outside the line of liturgical development. It is a mere isolated appearance, not a living germ. The Scholiast adds, in the lower margin of the "Feilire", that the conception (Inceptio) took place in February, since Mary was born after seven months -- a singular notion found also in some Greek authors. The first definite and reliable knowledge of the feast in the West comes from England ; it is found in a calendar of Old Minster, Winchester (Conceptio S'ce Dei Genetricis Mari), dating from about 1030, and in another calendar of New Minster, Winchester, written between 1035 and 1056; a pontifical of Exeter of the eleventh century (assigned to 1046-1072) contains a "benedictio in Conceptione S. Mariae "; a similar benediction is found in a Canterbury pontifical written probably in the first half of the eleventh century, certainly before the Conquest. These episcopal benedictions show that the feast not only commended itself to the devotion of individuals, but that it was recognized by authority and was observed by the Saxon monks with considerable solemnity. The existing evidence goes to show that the establishment of the feast in England was due to the monks of Winchester before the Conquest (1066). The Normans on their arrival in England were disposed to treat in a contemptuous fashion English liturgical observances; to them this feast must have appeared specifically English, a product of insular simplicity and ignorance. Doubtless its public celebration was abolished at Winchester and Canterbury, but it did not die out of the hearts of individuals, and on the first favourable opportunity the feast was restored in the monasteries. At Canterbury however, it was not re-established before 1328. Several documents state that in Norman times it began at Ramsey, pursuant to a vision vouchsafed to Helsin or Æthelsige, Abbot of Ramsey on his journey back from Denmark, whither he had been sent by William I about 1070. An angel appeared to him during a severe gale and saved the ship after the abbot had promised to establish the Feast of the Conception in his monastery. However we may consider the supernatural feature of the legend, it must be admitted that the sending of Helsin to Denmark is an historical fact. The account of the vision has found its way into many breviaries, even into the Roman Breviary of 1473. The Council of Canterbury (1325) attributes the re-establishment of the feast in England to St. Anselm, Archbishop of Canterbury (d. 1109). But although this great doctor wrote a special treatise "De Conceptu virginali et originali peccato", by which he laid down the principles of the Immaculate Conception, it is certain that he did not introduce the feast anywhere. The letter ascribed to him, which contains the Helsin narrative, is spurious. The principal propagator of the feast after the Conquest was Anselm, the nephew of St. Anselm. He was educated at Canterbury where he may have known some Saxon monks who remembered the solemnity in former days; after 1109 he was for a time Abbot of St. Sabas at Rome, where the Divine Offices were celebrated according to the Greek calendar. When in 1121 he was appointed Abbot of Bury St. Edmund's he established the feast there; partly at least through his efforts other monasteries also adopted it, like Reading, St. Albans, Worcester, Gloucester, and Winchcombe. But a number of others decried its observance as hitherto unheard of and absurd, the old Oriental feast being unknown to them. Two bishops, Roger of Salisbury and Bernard of St. Davids, declared that the festival was forbidden by a council, and that the observance must be stopped. And when, during the vacancy of the See of London, Osbert de Clare, Prior of Westminster, undertook to introduce the feast at Westminster (8 December, 1127), a number of monks arose against him in the choir and said that the feast must not be kept, for its establishment had not the authority of Rome (cf. Osbert's letter to Anselm in Bishop, p. 24). Whereupon the matter was brought before the Council of London in 1129. The synod decided in favour of the feast, and Bishop Gilbert of London adopted it for his diocese. Thereafter the feast spread in England, but for a time retained its private character, the Synod of Oxford (1222) having refused to raise it to the rank of a holiday of obligation. In Normandy at the time of Bishop Rotric (1165-83) the Conception of Mary, in the Archdiocese of Rouen and its six suffragan dioceses, was a feast of precept equal in dignity to the Annunciation. At the same time the Norman students at the University of Paris chose it as their patronal feast. Owing to the close connection of Normandy with England, it may have been imported from the latter country into Normandy, or the Norman barons and clergy may have brought it home from their wars in Lower Italy, it was universally solemnised by the Greek inhabitants. During the Middle Ages the Feast of the Conception of Mary was commonly called the "Feast of the Norman nation", which shows that it was celebrated in Normandy with great splendour and that it spread from there over Western Europe. Passaglia contends (III, 1755) that the feast was celebrated in Spain in the seventh century. Bishop Ullathorne also (p. 161) finds this opinion acceptable. If this be true, it is difficult to understand why it should have entirely disappeared from Spain later on, for neither does the genuine Mozarabic Liturgy contain it, nor the tenth century calendar of Toledo edited by Morin. The two proofs given by Passaglia are futile: the life of St. Isidore, falsely attributed to St. Ildephonsus , which mentions the feast, is interpolated, while, in the Visigoth lawbook, the expression "Conceptio S. Mariae" is to be understood of the Annunciation. The procession at the Panjim Church is one of the most attended events during the period of lent in Panjim.